For years, HubSpot’s inbound methodology has focused on a pretty linear, 4 step journey (Attract – Convert – Close – Delight). A major theme at INBOUND 18 was the next evolution of the Inbound model: The Flywheel. Customers’ buying behaviors are evolving and they rely more on trust and word-of-mouth vs marketing and sales touches. HubSpot shared that 81% of customers trust opinions from their friends and family members over advice from companies. 55% of customers don’t trust companies they buy from as much as they used to. Another key theme at INBOUND was Conversation Marketing, where we nurture 1-1 relationships with customers through real-life engagement, listening to their feedback, and acting on it. Martech, salestech, big data are all still important, but nothing replaces actual conversations and listening. We heard speakers say things like, “when did not talking to our customers become a goal?” or “we have an over-emphasis on scale.” Speakers shared that customers WANT to talk face-to-face these days, but they want to do it on their own terms (e.g. live chat). We also heard a lot about martech and the dizzying array of alternatives that are available. With so many options on the market, it’s important to remember two things: 1) technology should support your strategy, it doesn’t become the strategy. Also, technology will not fix your strategy if it is broken. 2) be cautious of losing connection to your customer. At some point, technology can potentially make us less connected. 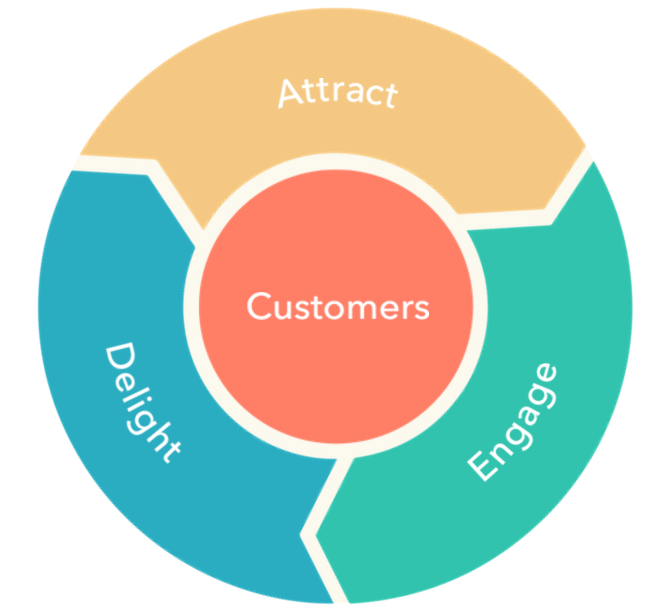 Getting back to The Flywheel, you have to ask yourself how your martech/sales tech stack is helping you put the customer experience at the center of your growth strategy. Finally, with the customer experience core to your success, marketing and sales have to be seamlessly integrated and working together at all stages. Marketing doesn’t stop after customer acquisition, and marketing should be involved in customer experience strategy right from the start. Earn your customer’s attention, don’t steal it. They asked “how does your opinion of a company change when you get an unwanted outreach?” Respondents said that 85% of the time, they have a lower opinion. This is because we’re trying to get their attention on our terms, not theirs. Solve for the customer’s success, not your systems. We shouldn’t impose our process or organizational structure on the customer; they don’t care. They want their questions answered and their problems solved. Own our mistakes. HubSpot asked, “if a company you regularly buy from made a mistake but apologized and made it right, would you continue to buy from them?” 96% said yes. Make pricing open, clear, and fair. If pricing is confusing, 69% of customers won’t buy. If it’s not on the website, 75% will look for an alternative. Don’t block the exit. Make it easy to buy but don’t make it hard to leave. If a customer knows they can leave you painlessly, 89% are more willing to buy. Putting your customer at the center needs to be a team sport. According to HubSpot, only 46% of companies say that their sales and marketing functions are aligned. They also reported that 80% of content created by marketing is completely untouched by sales because either a) sales doesn’t see value in the content, or b) marketing doesn’t make it easy to use. Our brains are buzzing after attending INBOUND 18. Whether or not you’re a HubSpot customer, this conference brings together some of the best modern marketers and it gives us plenty of food for thought each year. We’ll be talking a lot about how we can apply The Flywheel to our business practices, and we look forward to next year. Did you attend INBOUND 18? What did you think?